Entrance hall with storage cupboard housing washer/dryer and telephone entry system. The hallways lead into spacious living areas with dining area and open plan kitchen. 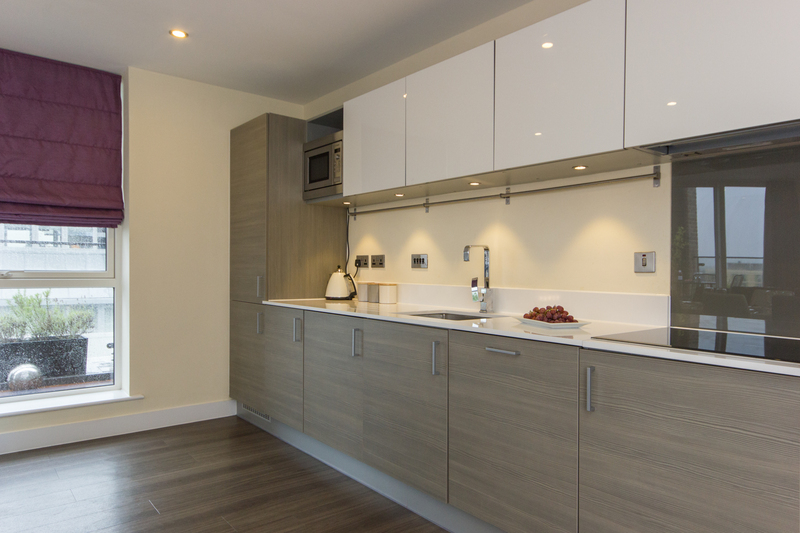 The well-appointed, fully equipped, kitchens include fridge/freezer, dishwasher, built in oven, induction hob and microwave. 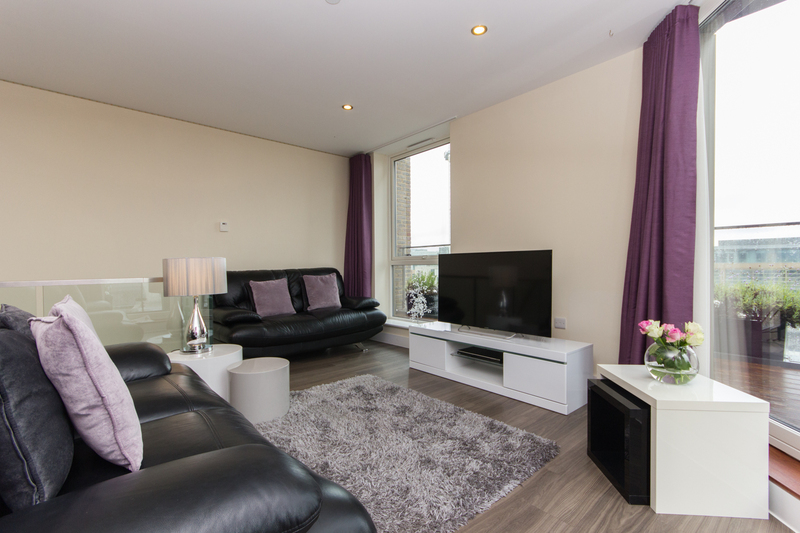 The spacious lounge areas all contain comfortable seating areas, a widescreen digital TV, DVD player, iPhone docking station and digital radio. 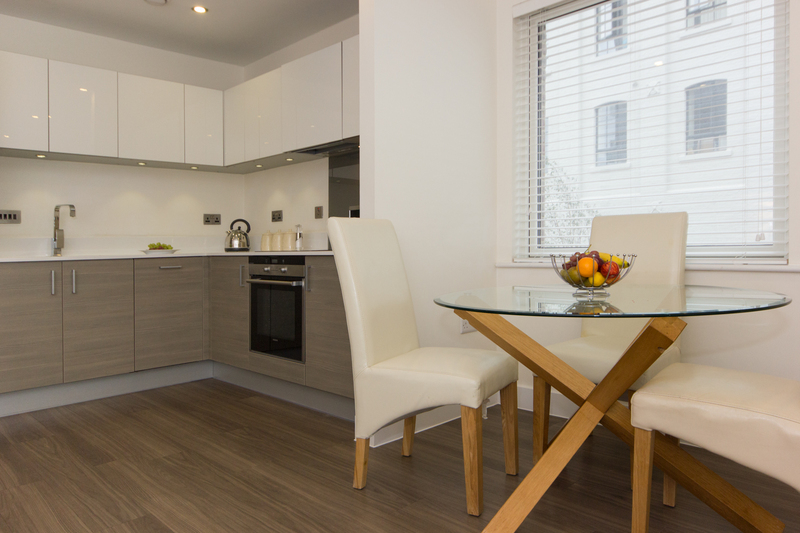 All the apartments offer access to balcony via lounge providing space for dining. 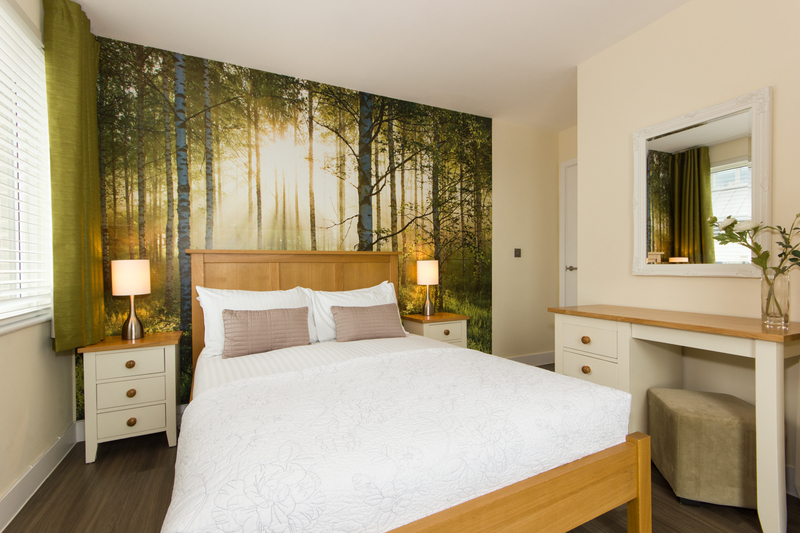 The light and airy bedrooms offer king-sized beds with pocket sprung mattresses, luxury Egyptian cotton linen, TV/ DVD players, bedside units and built in wardrobes. Each luxury bathroom comprises a shower over bath, contemporary style hand basin, heated towel rail, complimentary White Company toiletries and low-level W.C. 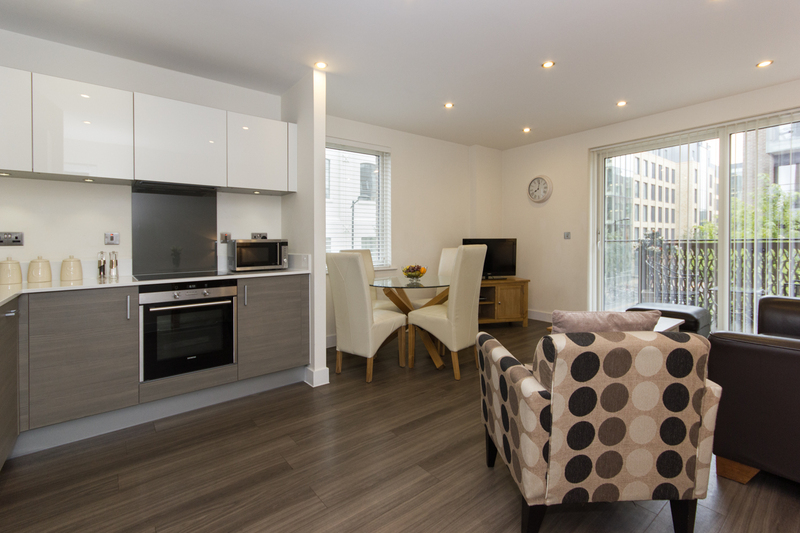 The luxury Mill Park apartments in Cambridge also benefit from free unlimited Wi-Fi throughout as well as undercroft parking which must be reserved at booking and is subject to availability. There is also access to bike stores. Entrance to a hallway with telephone entry system, utility cupboard with washer/dryer and access to the open plan living and dining area with views over two aspects of the vibrant new CB1 living area. Access to private balcony for al fresco dining is from the living area. The lounges all contain comfortable and relaxing seating areas with widescreen digital TV, DVD player, iPod docking station and digital radio. 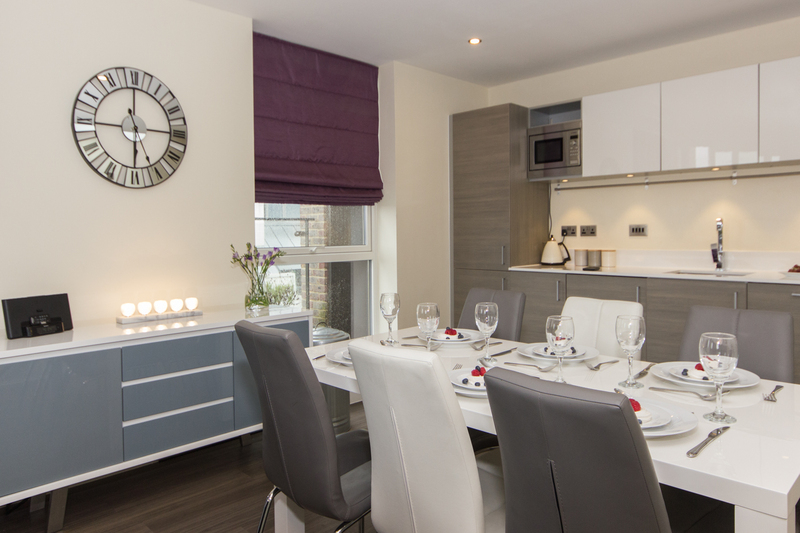 The adjoining dining area leads into the open plan, fully equipped kitchens which include all the following; built in oven, induction hobs, fridge/freezer, dishwasher, and microwave. 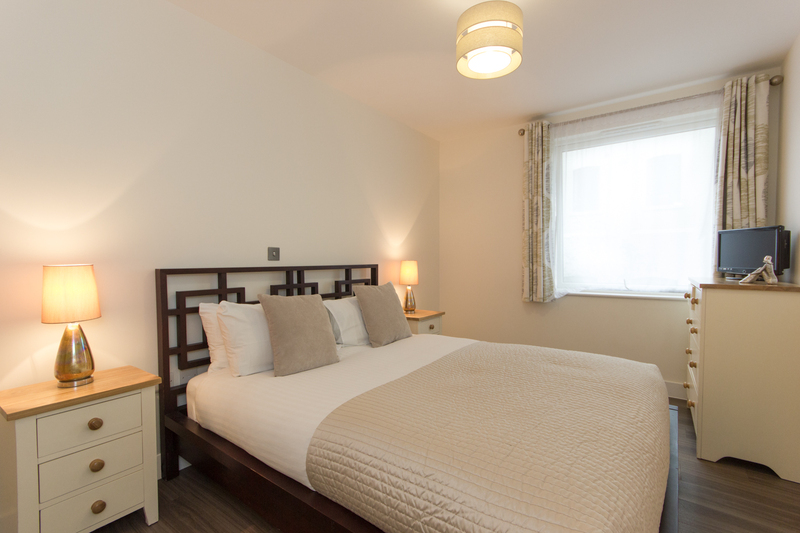 Each master bedroom at Citystay’s Mill Park two bedroom apartments contain king sized beds with pocket sprung mattresses, luxury Egyptian cotton linen, TV/DVD players, bedside units, built in wardrobes and vanity units. The master bedrooms all benefit from access to en-suite bathrooms with walk-in showers, contemporary hand basins and a low-level W.C. 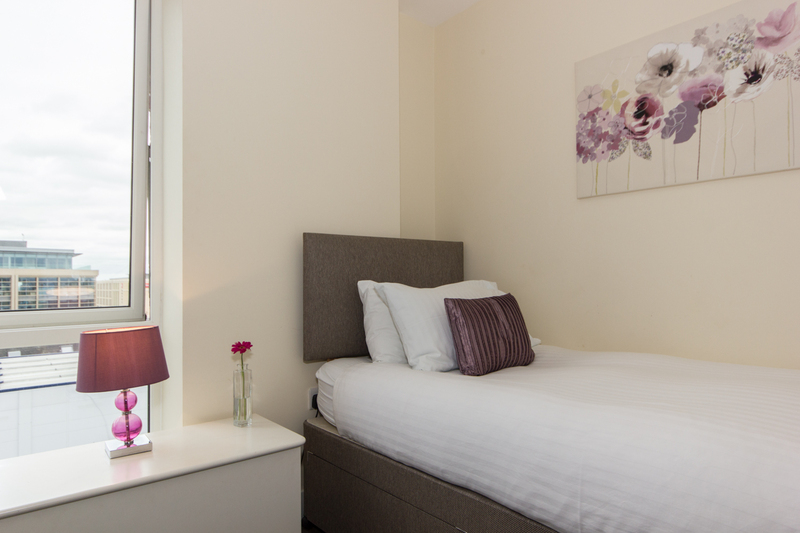 The second bedrooms are accessed from the hallway and all contain king or double beds with pocket sprung mattresses and luxury Egyptian cotton linen, TV/DVD players, bedside units and built in wardrobes. 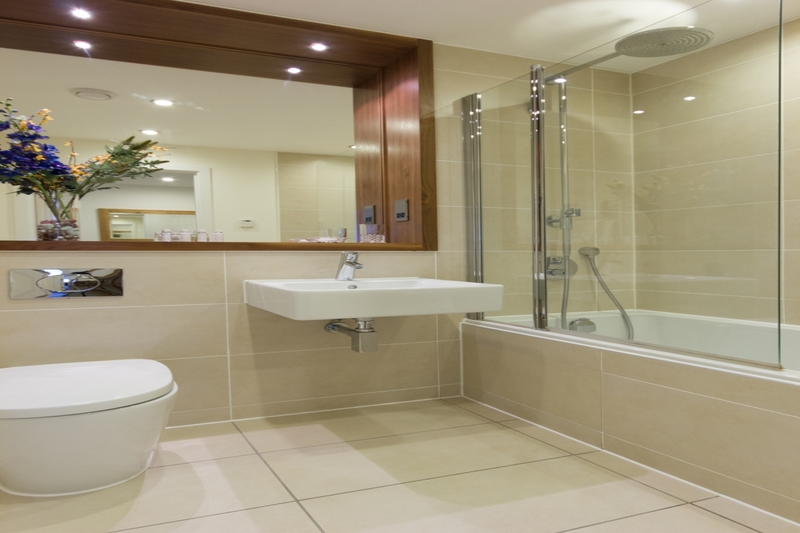 A main bathroom contains bath over shower, contemporary wash basin, low level W.C. and heated towel rails. 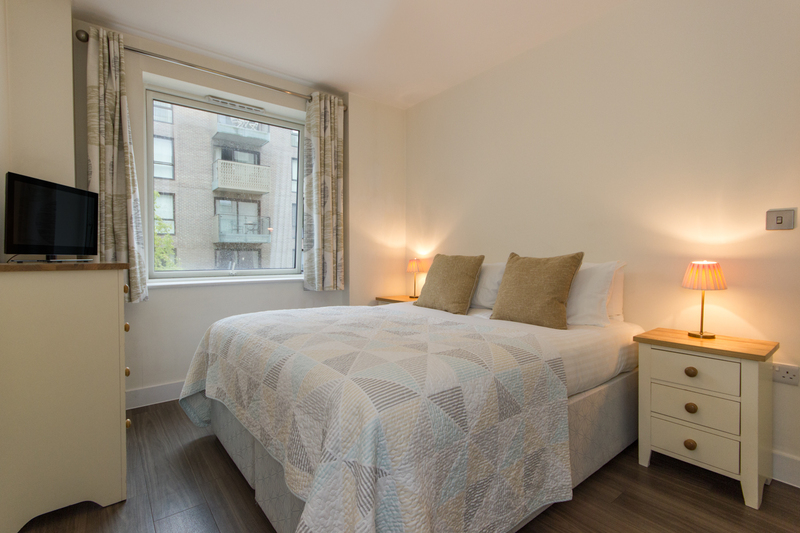 This apartment also benefits from unlimited Wi-Fi throughout, underfloor heating, communal landscaped gardens and undercroft parking, which must be reserved and is subject to availability. There is also bike stores on site. 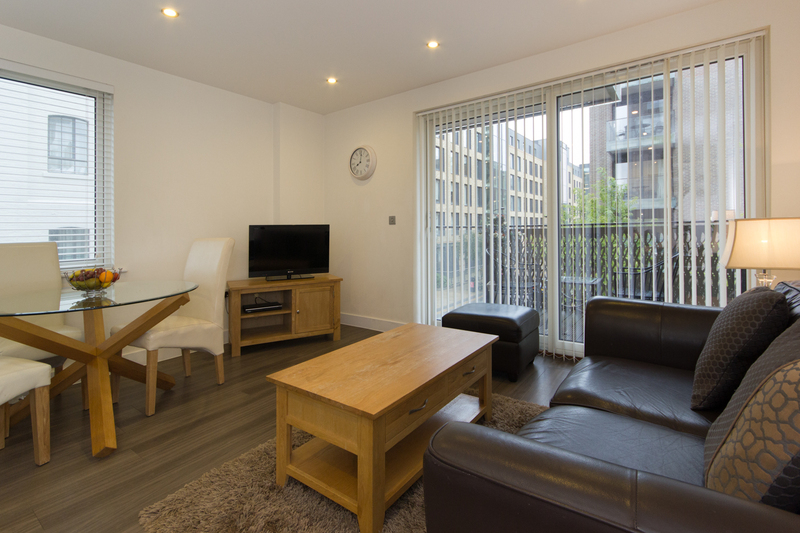 Citystay top-floor duplex three-bedroom serviced apartment overlooks all Cambridge from its wrap around, dual aspect balcony. Entrance to the apartment in on the lower floor, with the glass balustrade stairway on the left, the hallway offers access three bedrooms. The master bedroom contains a king-sized bed with pocket sprung mattress, luxury Egyptian cotton linen, bedside units, built in wardrobes, a vanity unit and access to an en-suite bathroom. 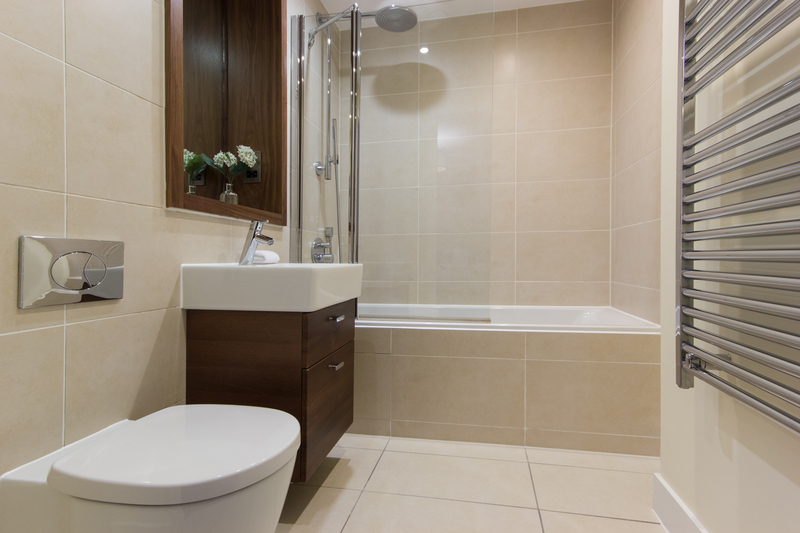 The en-suite contains a walk-in shower, contemporary hand basin, low level W.C. and heated towel rail. 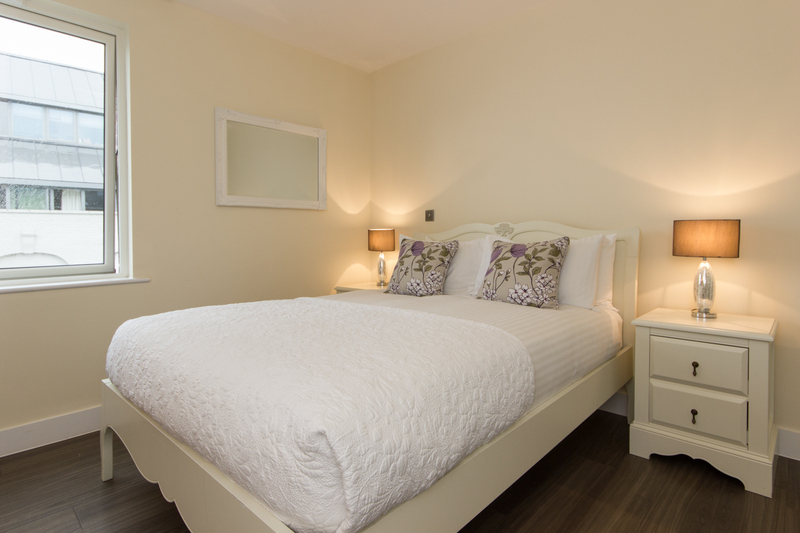 A second bedroom contains a double bed, again with a pocket sprung mattress, luxury Egyptian cotton linen, bedside units, built in wardrobes and vanity unit. The third bedroom contains two single beds, one of which has dual functionality as a desk/work space. 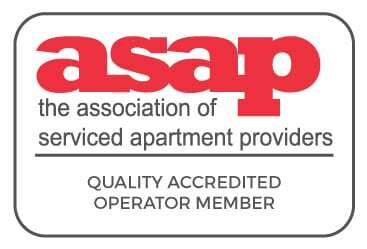 The apartments main bathroom comprises a shower over large bath, contemporary wash basin, low level W.C. and heated towel rails. The stairway leads into an open plan, living, dining and kitchen area, offering views over the city. The dining table is large enough for six and perfect for entertaining. 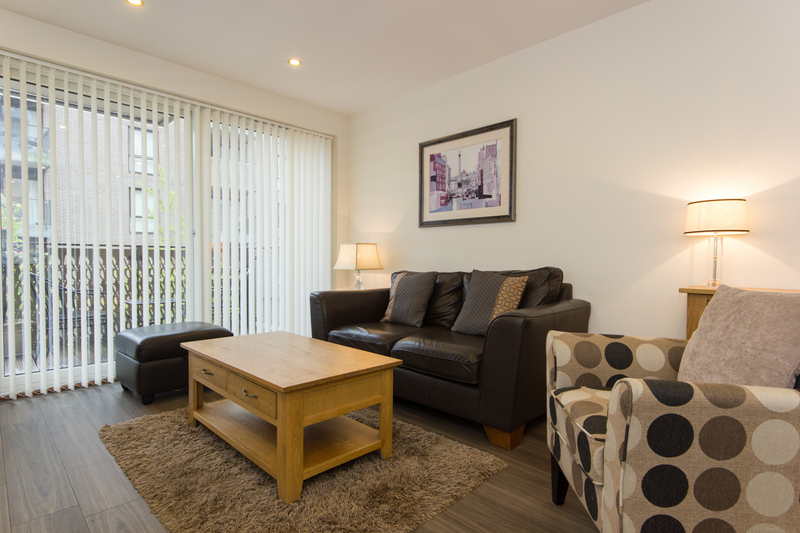 The lounge offers leather sofas, widescreen TV, DVD player, iPod docking station and digital radio. 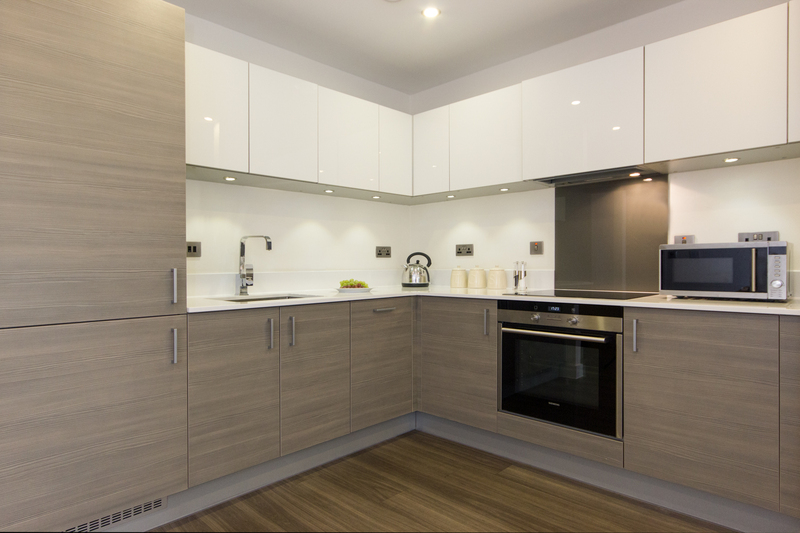 A large fully equipped kitchen contains a built in over with induction hob, fridge and freezer, washer/dryer, coffee machine and microwave. The dual aspect wrap around balcony is accessed from the main lounge and provides the ideal space for al fresco dining with vistas across the city. 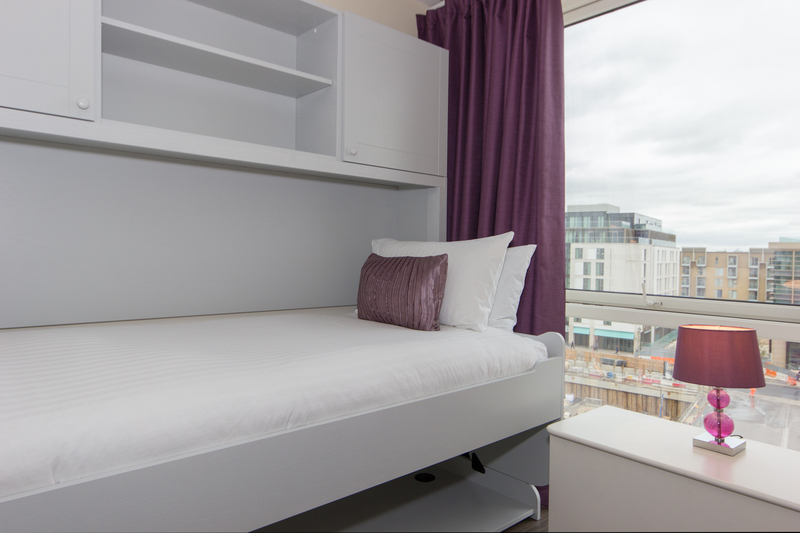 There is unlimited Wi-Fi throughout the apartment as well as access to undercroft parking which must be reserved at the point of booking and is subject to availability. There are also bike stores on site.